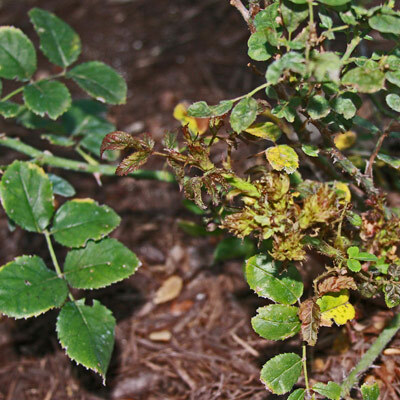 PLANTanswers: Plant Answers > What is Wrong with my Knockout Roses? 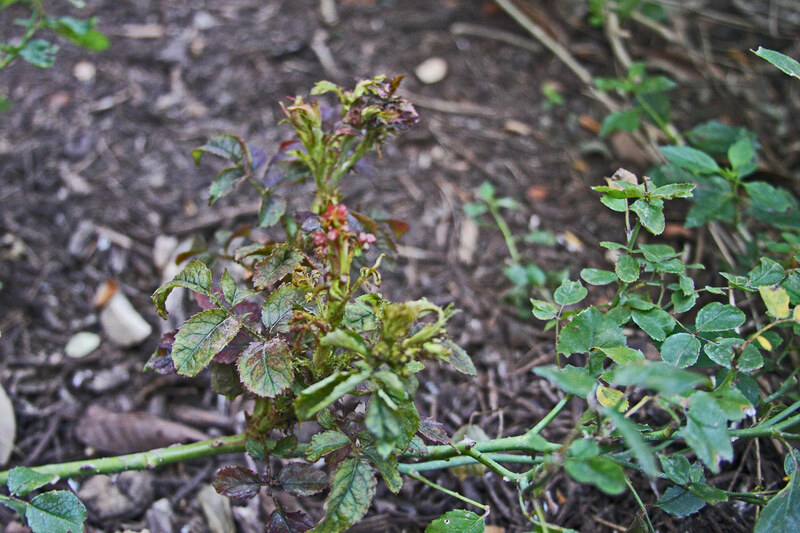 Plant Answers > What is Wrong with my Knockout Roses? What is Wrong with my Knockout Roses? Do you have a Beauty-Turned-Into-A-Beast problem with your ‘Knock-Out’ rose bushes!?!? It is NOT the fault of the rose variety, i.e., it is the fault of a little mite and a virus named Rose Rosette Virus (RRV). What do you have written or do you know of good sources for information on this new rose problem? I think I saw it today. Does Mike Merchant have any information about it? Neil’s Answer: The best way I can describe RRV when I don’t have access to a photo is that the plants produce extremely strong “bull” canes that have probably 10 times the thorns of healthy stems. Growth is typically very red, and the buds fail to open properly (but not like damage of thrips). They look like they have been hit by 2,4-D drift. It’s a horrific problem for serious rose growers. ‘Knock Out’ s seem especially vulnerable. Here’s what Neil Sperry posted. 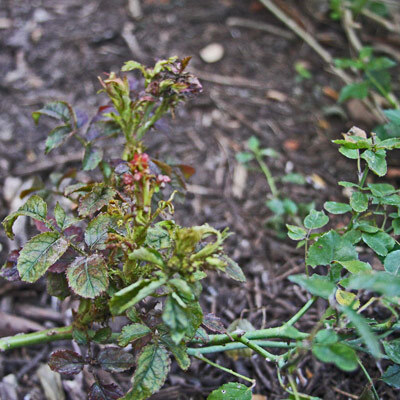 April 23: Garden Tip: It's sad news when your rose bush develops strong bull canes or witches' brooms of new growth that are covered with spines. 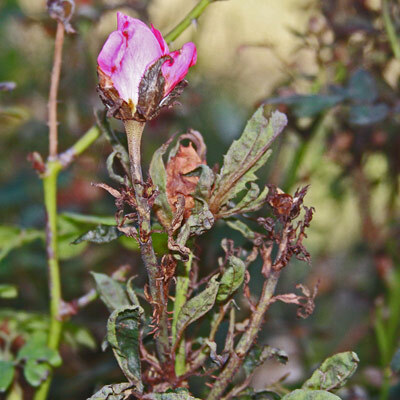 That's the fatal rose rosette virus, and it is becoming more and more common in Texas and America. It has probably spread to your plants from others in your neighborhood, carried by a tiny mite. Afflicted plants need to be removed entirely – roots, tops and all – and destroyed. Once you see rosette in real life, you'll begin seeing it fairly commonly. This commercial landscaper on Legacy north of 121 needs to remove all plants that show any signs. There is no remedy. This weekend I regretfully cut down two rose bushes on the side of my home. 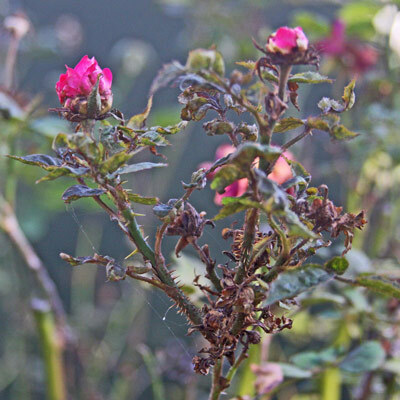 Within a relatively short period of time they had begun to show symptoms of rose rosette, a fatal virus disease of roses. Yellow peach Knockout rose showing the excessive thorniness associated with rose rosette disease. I had never heard of rose rosette until a recent sample arrived from the Denton County Extension office. Horticulture agent Janet Laminack wanted to know if the sample was rose rosette. 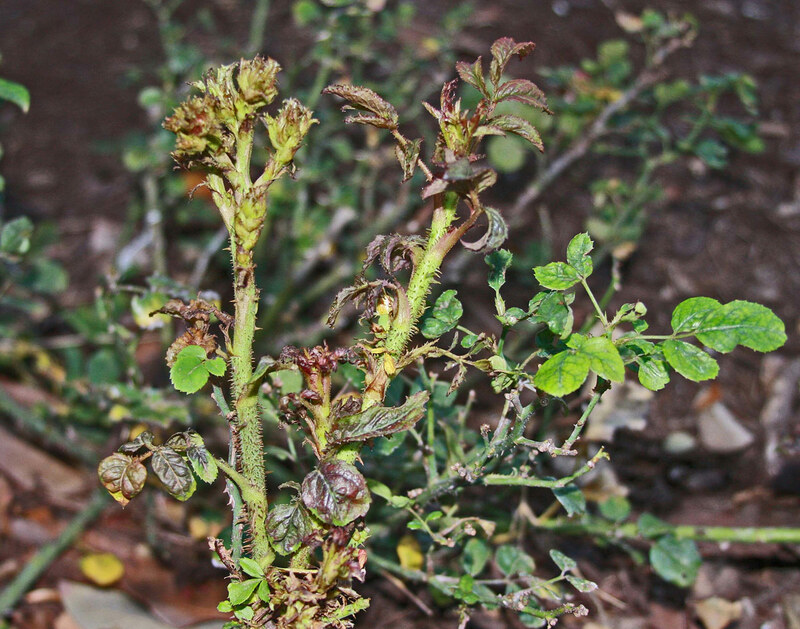 The symptoms seen on these rose cuttings, I learned, were classic: excessive thorn production, leaf distortion and excessive branch development, known as witches broom, at the ends of branches. 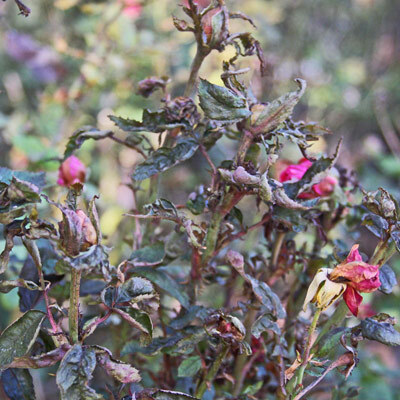 Wild multiflora roses are the most susceptible, though gardeners throughout the eastern U.S. are beginning to see the disease in cultivated roses. The samples sent to me from Denton included yellow peach and red Knockout roses. At our home the two roses I suspected with the disease included an ‘Archduke Charles’ and a ‘Pinkie’ climbing rose (neither of which were positively confirmed). The disease, which is now thought to be a negative sense RNA virus is transferred from plant to plant by a very tiny eriophyiid mite called Phyllocoptes fructiphilus. According to a Kansas State University publication by ornamental insect specialist Dr. Ray Cloyd, the offending mite is 140 to 170 microns long, and approximately 50 microns wide (the average human hair is about 100 microns wide), and may be seen with a good hand lens (and a good imagination I might add) between the leaf petioles and axillary buds of infested roses. Cloyd notes that these ingenious mites move from plant to plant by attaching to insects, or they may disperse via air currents from infested to healthy plants. 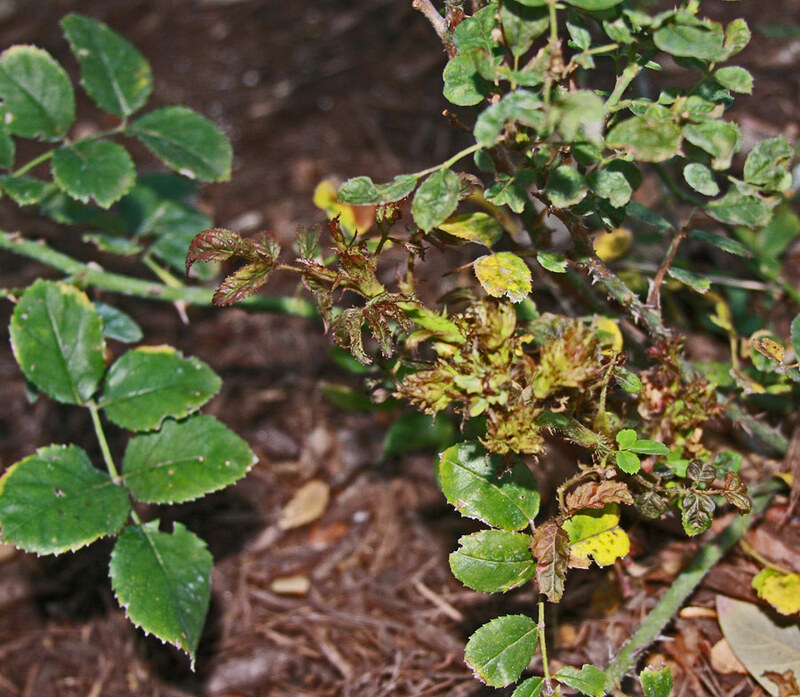 Symptoms on multiflora roses appear 90 days or more after infestation. Witches broom symptoms of rose rosette. Reddening of affected leaves is seen on some plants. 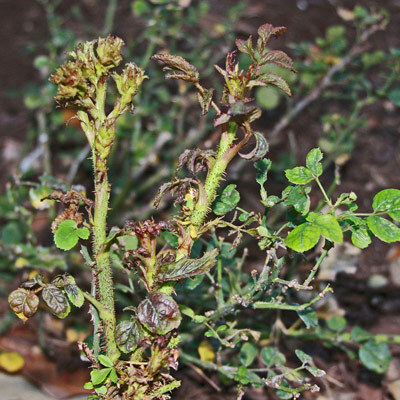 Rose rosette is not a new disease, though Kevin Ong with the Texas Plant Disease Diagnostic Lab, reports that he is receiving more questions about rose rosette this summer (2017). 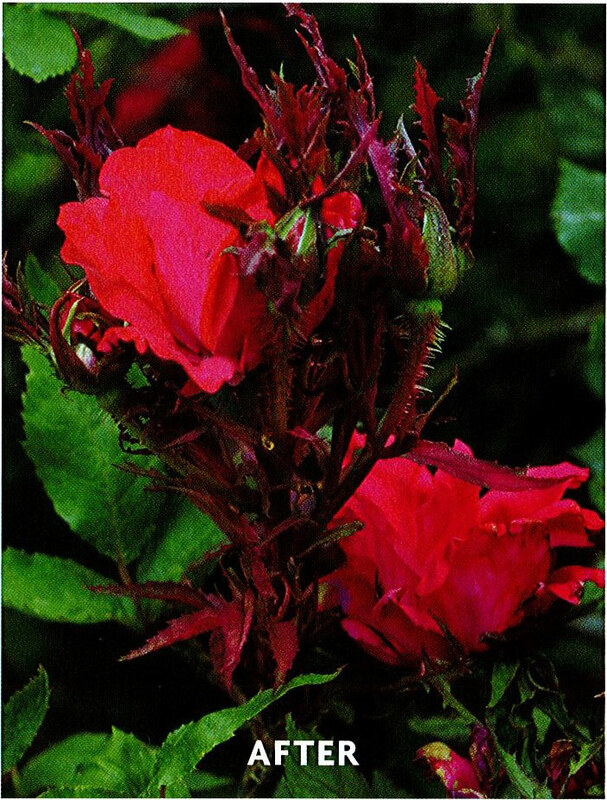 The late Field Roebuck wrote an informative Dallas Morning News article in 1999 covering the history of rose rosette in Texas, noting that the first reports of the disease were in the early 1990s. 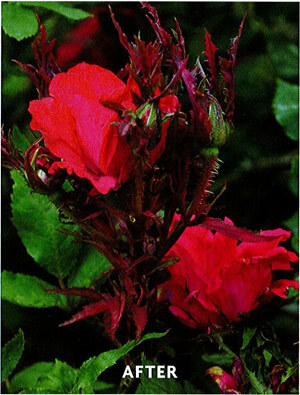 Flare-ups, he noted, occur from time to time, but so far the disease has not posed a major threat to cultivated roses. Still, it hurts to lose a favorite rose. Dr. Cloyd recommends abamectin, bifenthrin, carbaryl and endosulfan as effective miticides; however it also notes that long-term control of these mites is not really practical. “The most prudent solution,” he notes, “is to completely destroy infected rose plants.” This includes digging up and removing the roots. Perhaps the best use of sprays is as temporary protection for plants growing close to an infected plant that you have dug out. 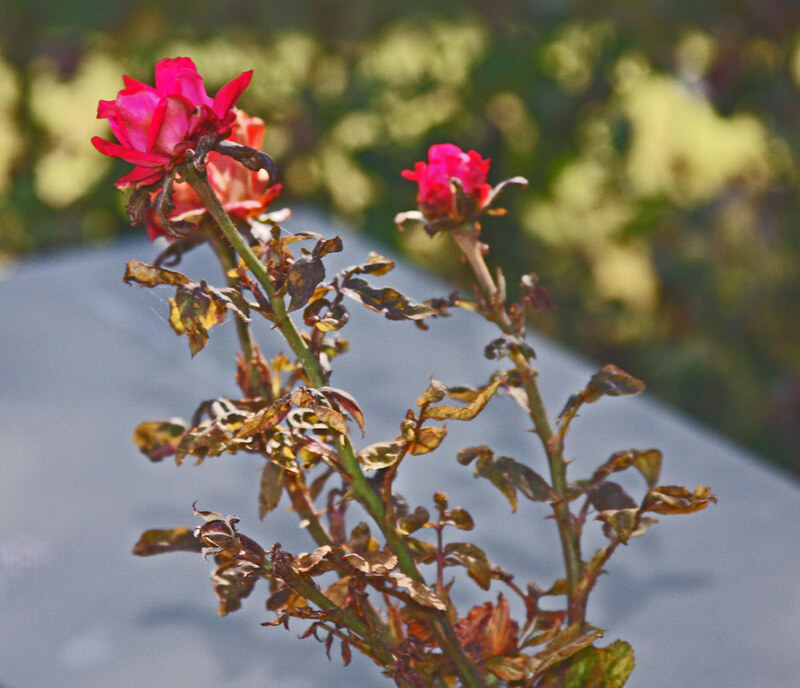 The rose is attacked by a plethora of fungal, bacterial and viral diseases which generally cause leaf spotting, distortion, discoloration, and defoliation, reducing the ornamental value of these plants but generally not killing them. 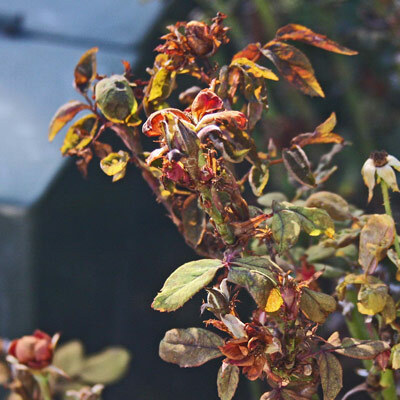 Rose Rosette Virus (RRV), however, is currently killing large numbers of garden roses and threatening the future of the garden rose industry. This disease has been known since the 1940’s and is widespread east of the Rocky Mountains. The symptoms for RRV, which may vary with the rose cultivar, commonly include proliferation of lateral shoots causing a witches broom appearance, unusual thorniness and reddening of these shoots and distorted flowers. Eventually, this leads to stunting, defoliation and death of the plant. Although the disease has been known for 70 years, it was not until 2011 that the causal agent was determined by the Tzanetakis laboratory at the University of Arkansas to be a virus. The disease complex has three important biological components: the Rose Rosette Virus (RRV), the eriophyid mite (Phyllocoptes fructiphilus) and the large expanses of naturalized Rosa multiflora east of the Rocky Mountains. RRV is an emaravirus, which is a newly described group of viruses that use RNA instead of DNA for its genetic code. RRV has several pieces of RNA instead of one, is surrounded by a membrane and is transmitted by an airborne eriophyid mite (Phyllocoptes fructiphilus). There are a few other emaraviruses that attack corn, fig and mountain ash, all transmitted by eriophyid mites that have been described. Little is known about how the virus is taken up or transmitted by the mite. It is known, however, that this small mite (140- 170 microns) feeds on the tender plant tissues and overwinters on the rose plant. The mite can move about 100 meters per year via air currents and has the potential to reproduce very rapidly due to its eight day life cycle and its ability to lay an egg a day. 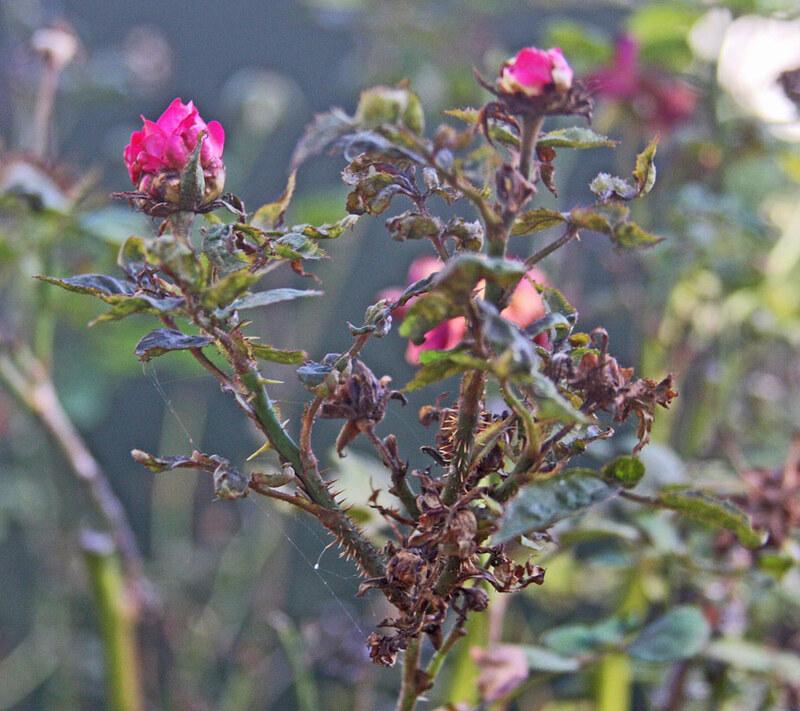 Susceptible roses infected by viruliferous P. fructiphilus develop symptoms 30 to 146 days after infection. This virus/vector pair originated in the western part of the United States and has spread along with Rosa multiflora, a susceptible introduced rose species and now a widespread host of RRD. Thus, Rosa multiflora serves as the reservoir of inoculum and vector. 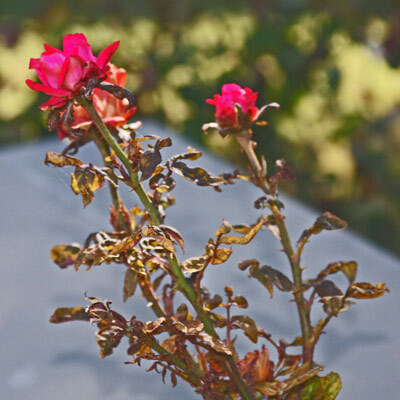 In recent years, the disease has spread onto garden roses via the mite vector throughout the central and eastern USA resulting in the death of countless rosebushes. 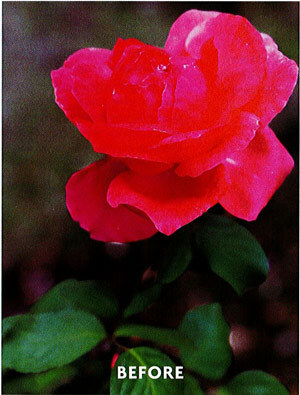 This has led to a reduction in the use of roses in the landscape. The current best management practices focus on either excluding the virus or preventing its spread by controlling the movement/populations of the mite vector. Approaches To Exclude The Virus In Your Planting Are The Following. Before planting your rose garden, eliminate RRD infected roses (cultivated and wild) from within 100 meters of your garden, as is possible. Only plant roses that are free of RRD. Monitor your garden on a weekly basis and eliminate any symptomatic plant as soon as it is identified. This lowers the virus level in your garden. 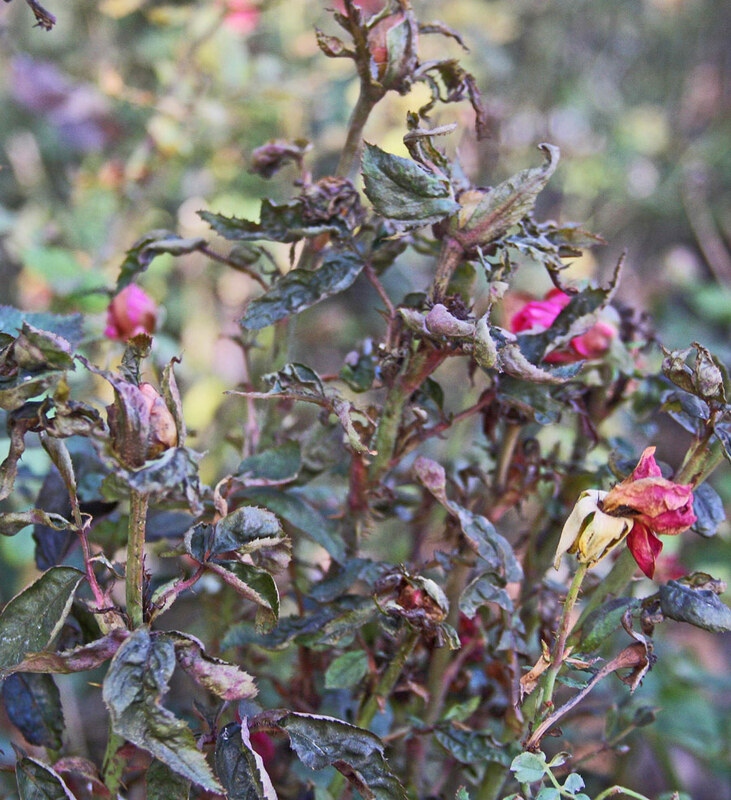 Experience in Tennessee in an area with high RRD pressure, the disease can be managed with the replacement of two to four percent of the roses per year. If you find RRD in your garden, continue to scout the area for source plants. It is likely that a nearby source will continue to contaminate your landscape if diseased plants are not removed. Approaches To Limit The Spread And Population Levels Of The Mite Are As Follows. Do not plant roses too close together as this increases the chances that the mites will crawl from one plant to another and spread the virus. Mixed plantings of non-Rosa spp. are useful. Both the mites and virus are specific to Rosa spp. When infected plants or debris is removed from the garden, bag it to prevent the mites from spreading. Do not use a blower to clean the debris out of a rose garden as this will likely spread mites well. Remember, these mites are small and spread by floating in the air. Mites can also travel on your clothing so do not go from a highly infested garden to another garden as it is likely you are carrying mites and thus spreading the disease. Mites are thought to survive only about eight hour s without a host. Therefore, if equipment, gloves and tools are free of rose debris, they can be reused the next day. 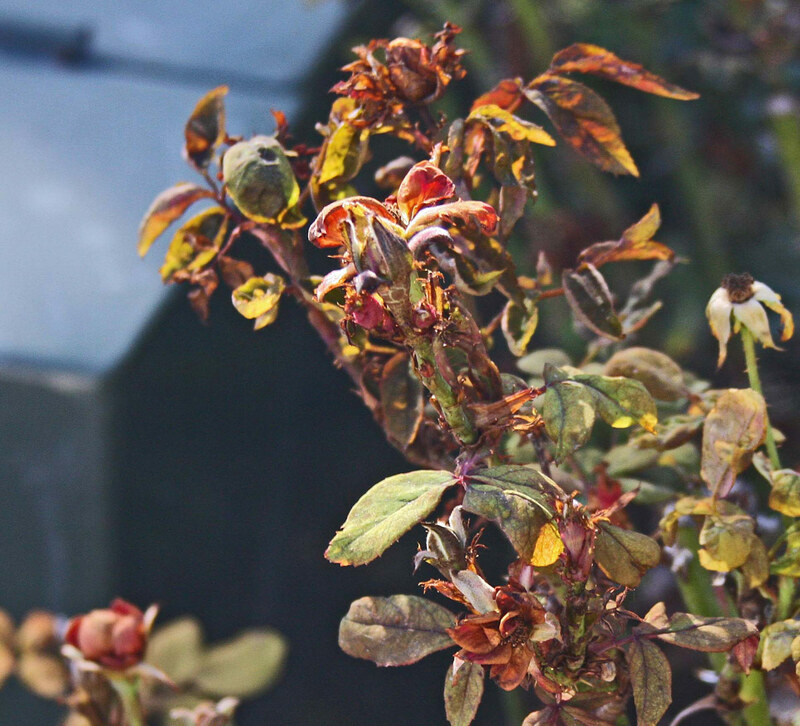 Prune your roses heavily in late winter to remove the overwintering mites. The prunings should be removed safely so mites do not spread. Apply dormant oil to reduce the numbers of mites still on the plants. Summer oil can be applied throughout the season as needed. ALL OF YOU ROSE GROWERS HAVE BEEN WARNED – BE AWARE AND BE VIGILANT!!!! Although selective pruning of affected canes has been suggested as a possible means of management, this has proved – so far – to be ineffective. If signs of the disease are detected, the affected plants must be rogued. Many plants infected with RRV may remain asymptomatic; it’s a good idea to remove plants immediately surrounding them, providing a safeguard against further infection. Rogued plants should not simply be removed from the site, but bagged where they stand prior to removal. Miticides have been suggested as possible “cure,” but to date, these methods have been unsuccessful. 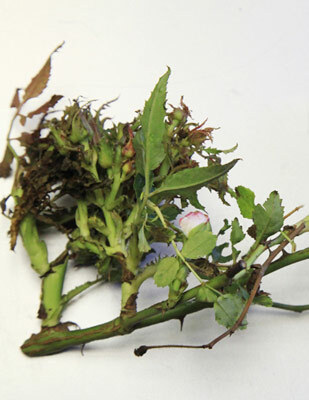 Witches’ brooms are a sure sign of rose rosette infestation, although at first the odd growth may appear to mimic the effect of herbicide drift. 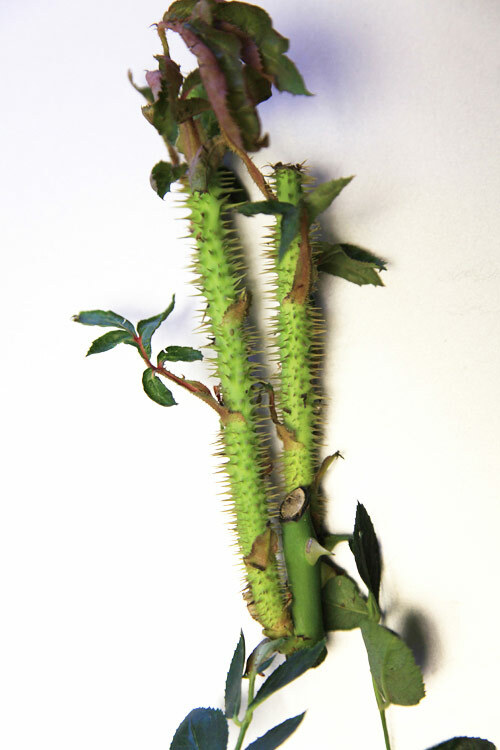 Where canes overproduce thorns, the growth may be so excessive that stems are covered. 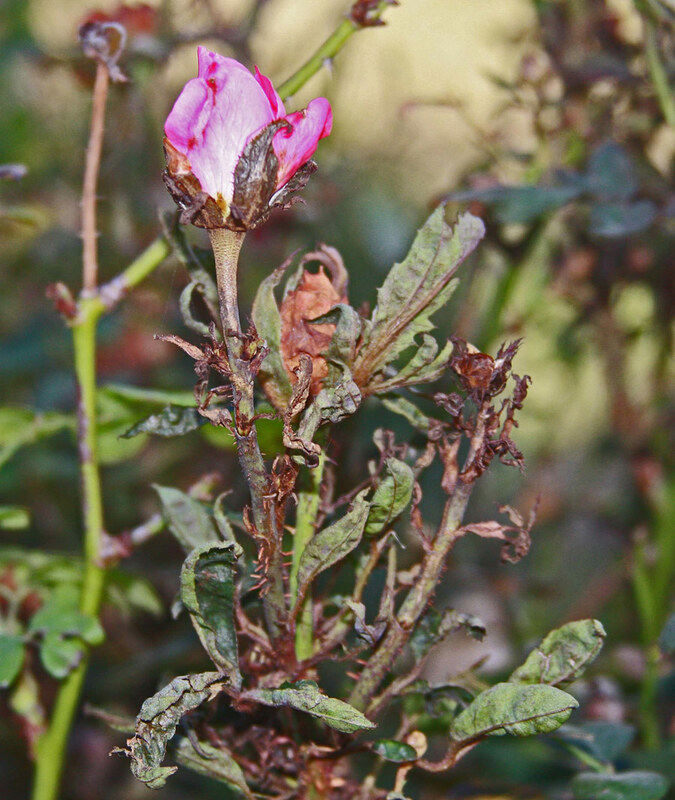 The most effective way to fight rose rosette disease: Vigilance; early detection; roguing of affected plants.